I've had this setup for a little over a month now, and did an experiment on vacation to see if I could make due with only solar based power to keep my phone charged for over a week. I managed about 13 days before I went back to plugging in at night at home, and was pretty happy with the overall capacity of this configuration. The panels are a 5W variety, putting out 1000mA @ 5v dc through a standard USB connector. 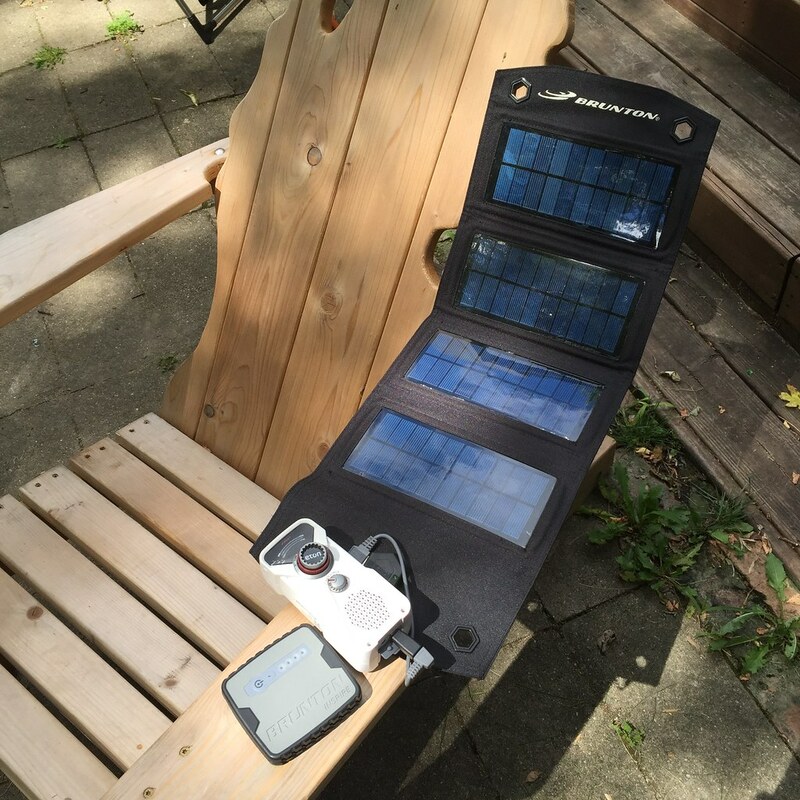 The kit includes a 3800mAh battery pack, which the panel is able to fully charge in about 5 hours of good sunlight. Additionally, I had a portable 2200mAh battery pack that I was topping off and using throughout my tests. Between the 2 packs I estimated I had about 4 or 5 full charge cycles with my phone under normal usage conditions for me. That gave me a lot of confidence in this setup for longer term uses, because I think that having about 5 days of reserve would be enough to keep things topped off in stormy or overcast conditions. The Eton radio was an impulse buy, and is OK for what it is. The tuner doesn't hold a match to similar sized Grundig radios, but at around $25 it's not really in the same price category either. There's a lot of reviews stating that the dyno burns out on these radios rather easily. I don't really look to the dyno as a means of primary power so that was of little concern to me. The main drawing feature was that this radio charges over USB, and has a flashlight and weather bands. The tuner is pretty sensitive and the dial is small so it can be tricky to dial in a favorite station in a radio congested area such as Grand Rapids where I live. Minus the radio, what did the rig run you? I think my decision is now solidified. Scottman has the Goal Zero Guide 7, which is a higher power output, but this one packs a bit smaller and I think has a better warranty. It might bme just the thing for my trip next May. I've been giving a long hard look at the options in the market for USB powered gear, and honestly there's a lot of cool stuff out there that makes something like this Brunton compelling to me. my UV purifier is a CamelBack bottle topper and my solar charger is a Brunton Freedom. In all of my kitsI have a couple of different charging cables (USB to Micro, USB to mini and USB to USB as well as a cheap little AA/AAA USB battery charger). Other devices in my rechargeable box include several Motorolla Talkabout radios and a charger bank/flashlight of unknown origin that I picked up off Amazon. My radio is still either the CountyComm.com or Grundig AA AM/FM/SW. This is a great time for solar devices, there is a whole raft of different types at reasonable prices so you can experiment without breaking the bank. And for us gear hoarders, that means that you can have a variety of options available to use at any given time. Just added another arrow to the quiver for going off grid for a while. A lot of folks know that most smart phones have GPS capabilities. Whats less well known, is that the GPS still works in airplane mode on iPhones. Airplane mode lets you use the phone but not the radios built into it. WiFi is disabled, bluetooth is disabled, and cellular is disabled. The result is a MASSIVE increase in battery life, since all these transmitters are now powered off. The way GPS works, doesn't require any transmitters, unlike all the previously mentioned radios. GPS is RX only, and works by calculating position against the signals of a constellation of satellites. Airplane mode has no affect on the GPS, and because of this, you can use Topo map software that supports offline mode, and use your smart phone as a very capable GPS device. yeah if woot runs a sale on the goal zero nomad one could buy two at that price to this new brunton (they were on sale for $35).... I htink I'll buy anohter one if they run that sale. My solar gear is a bit different than most others, since I refuse to carry a cellphone. It consists of a black plastic bag that heats up my shower water, a evacuated solar heater tube that boils my cooking water, and a solar rechargeable flashlight. I have a hunch that when machines take over the world, cellphones will lead the charge. what is your solar flashlight? right now my goal zero is charging my kozzy and my solar shower is being heated. I believe it is called a Nokero. Looks like this. http://www.amazon.com/Nokero-N202-Solar-...B00WL4LNUY I have another solar recharging flashlight, different design, that I purchase prior to Y2K, and it still works! Although the charge does not last as long now. Looks like a pretty decent setup! I run a goal zero Nomad 15 with a Sherpa 50 battery pack. works well to keep my ham radio functioning, as well as my laptop if i have it with me. also recharge camera batteries and top off the cell phone. How much does the solar array weigh? B.} People who are Not After My Guns. Though I am forced to live in exile, in the Twenty-First century; I am still proud to be a Citizen of the Twentieth Century.